Special thanks to McClanahan Studio for helping us capture the in-lab photography and to Nicki Hufford Photography for the use of her album. When we began the brainstorming process for the Miller’s Signature Album back in 2011, we had one clear goal in mind. We wanted to engineer an album with innovative options and simplicity to serve the changing needs of the modern photographer. After nearly two years of research and development (with loads of new additions), we released an album that is a true representation of the heart and soul of Miller’s Lab. 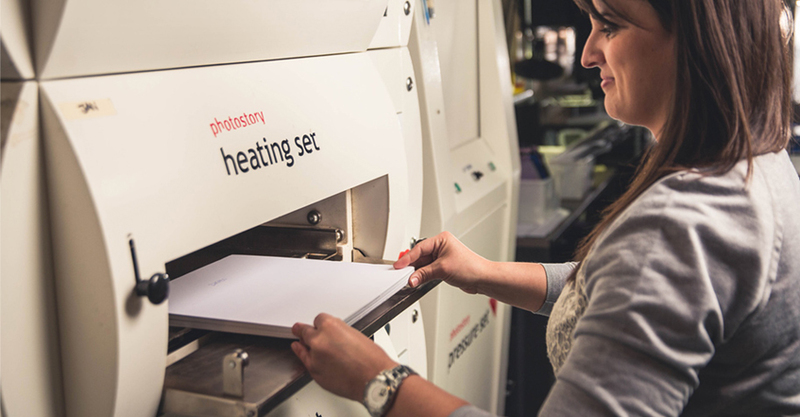 The process begins as soon as the photographer submits their album files to the lab. 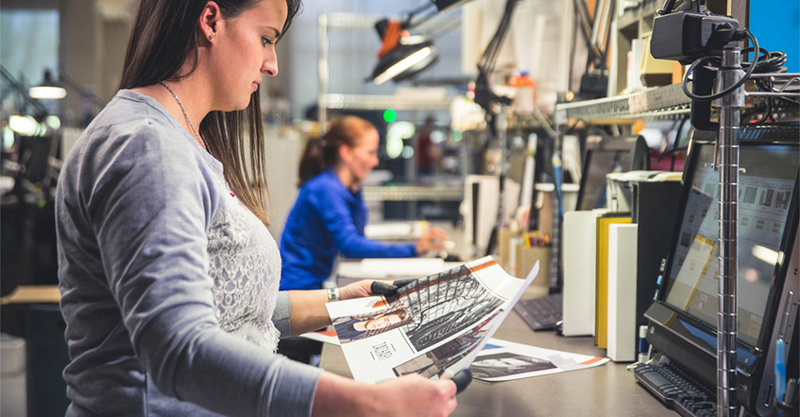 From there, we print the images and use a creaser to create a fold for the album. 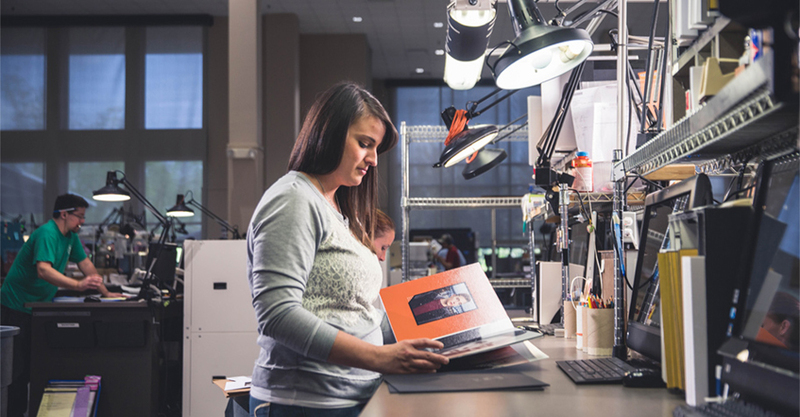 Once that step is complete, the layout of the album goes through an extensive checking process where specialists carefully inspect that the border, text, and design elements will display correctly within the album. If we catch something that doesn’t quite look right, we contact the photographer or make a quick adjustment before the creation process moves to the next phase. 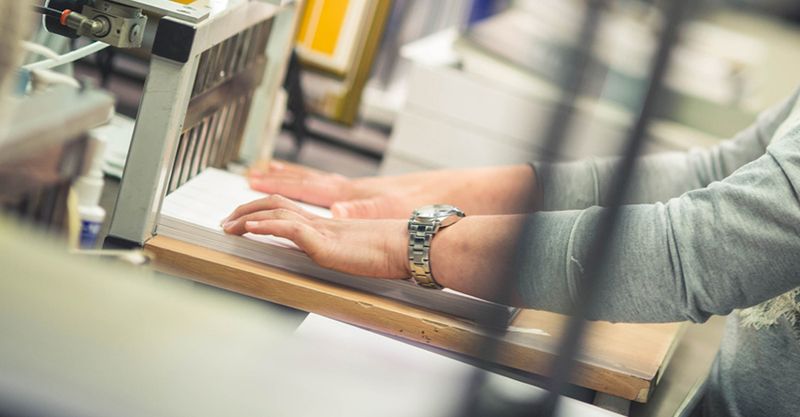 From papers and printers to inks and chemical solutions, every single element of the process is hand-tested daily for consistency and accuracy. 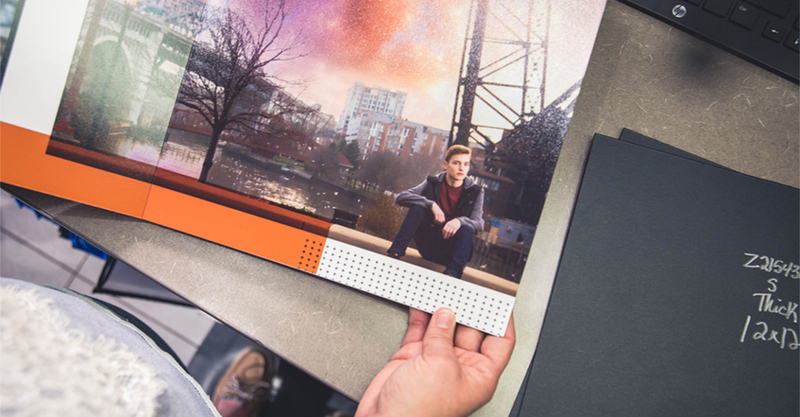 We take great pride in the quality of each album that comes into the lab and it is important that everything we do surpasses the expectations of the photographer and the end customer. Once the layout has been approved and the interior paper type has been attached, we create what we call the “album block” by shaping the current object into a square block. 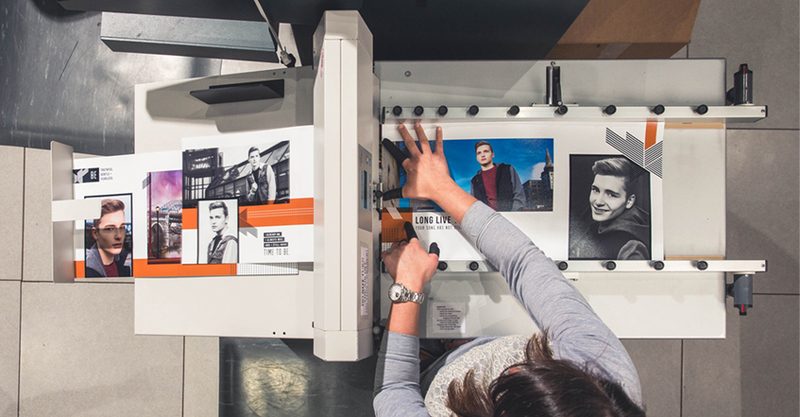 After this stage has been completed, the album block is baked and then pressed with a special machine that applies loads of pressure so the album lays flat. The baking and pressing phase can take anywhere from 30-45 minutes. While this journey might sound like some type of assembly line operation, you would be amazed at the small team of artisans that are solely dedicated to this specialty product. Typically a single album is touched by no more than 3 or 4 sets of hands before the creation is completed. After the album block has been baked and pressed, it goes through another vigorous inspection by our album team. If the block is up to our standards, it is hand-cut to the desired size and cleaned. 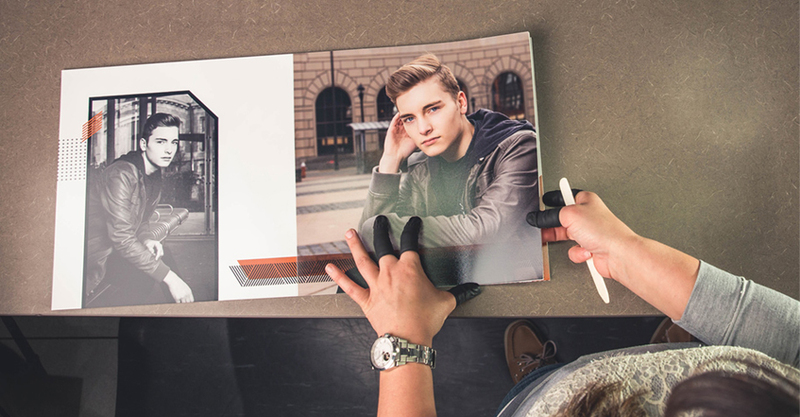 For the final step in the process, the album moves to the Covers department where the photographer has their choice of stunning options including Leathers, Linens, Custom Covers, Metal, Acrylic or Wood. The Miller’s Signature Album is truly a labor of love. 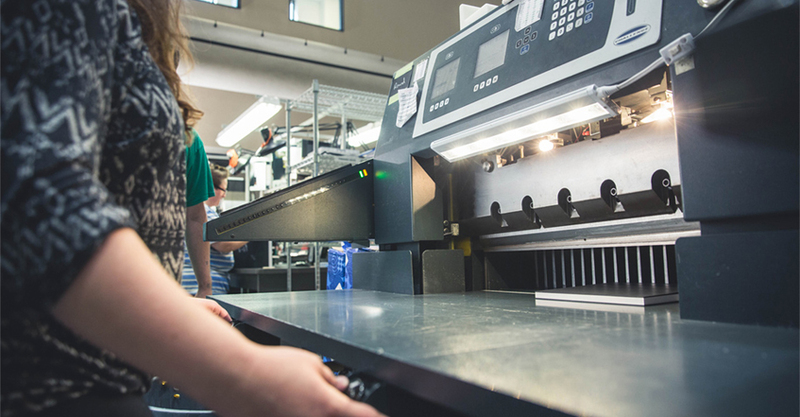 Could we find processes to cut down production costs or speed up the process even more? Perhaps we could, but that simply isn’t the point. There is an intrinsic beauty in transforming a group of images into a timeless creation through a combination of teamwork and handcrafted precision. We fell in love with the process of making something great and that spirit has guided us since our humble beginnings in downtown Pittsburg, KS. 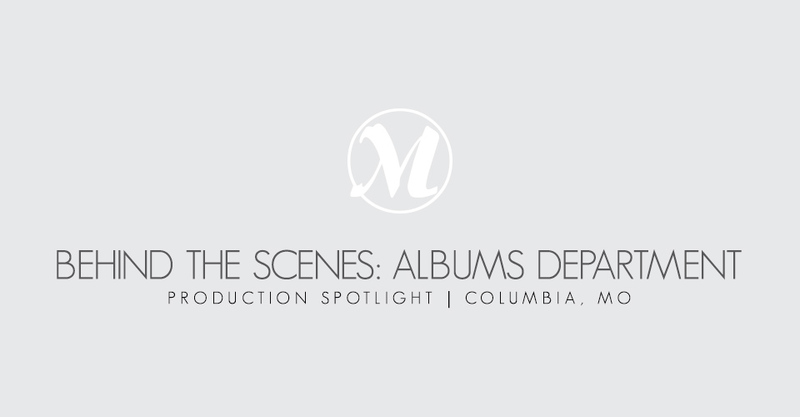 Take a peek at a few extra snaps from the Albums department in Columbia, MO. Thanks for sharing these great behind the scenes photos. We just recently toured the Columbia lab as we passed through on our way to Florida and I was thinking that everyone that uses Millers needs to see this. It is great to see how much work truly goes into making our works of art. And a special thanks to Tracy for taking time out of her busy schedule to give me and my family our tour (on a Monday even). Thanks for stopping by the lab Russell, we loved having you! Thanks for sharing this. I LOVE Millers albums and LOVE the customer service and now appreciate the process a little more. THANK YOU! Please keep doing this kinda stuff. Thanks Mort, we love the feedback! Awesome! This is why I love the signature albums! This album makes our studio stand out from the others! I love you MILLERS! Loved the behind the scenes. I had many wonderful albums made by the Miller team. High quality albums. Thank you! Thanks for showing us how careful and caring you are with our orders! Good job y’all! That is awesome!! Thank you for sharing these images!! Beautifully done presentation! Thanks for all the great work you all have done over the years! So pleased!! VERY nice to see the craftsmanship and care in producing albums! What a great share! 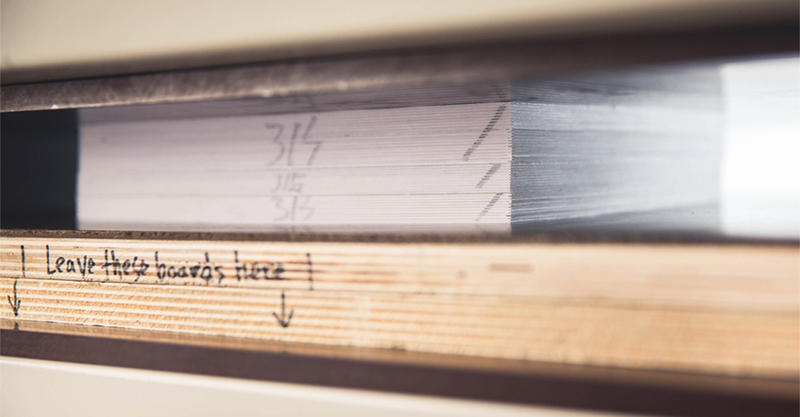 Absolutely love your signature albums, so it’s very neat to get a glimpse into the process. This was so fun to read! Thank you for sharing a little glimpse of the awesome people behind the scenes. This was so great! Thank you for sharing the behind the scenes of one of my (and my clients) favorite products! Such an amazing album and an equally amazing turn around time! You’re the best! to create memories for our customers. 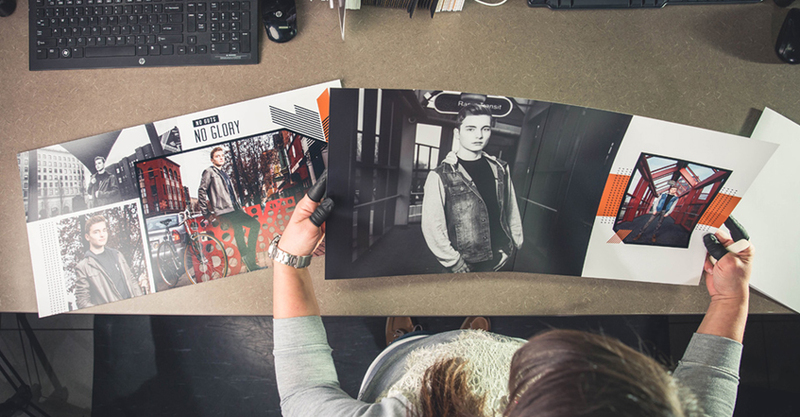 I love seeing the behind the stuff photos and reading how your awesome team brings our images to life! You guys are truly the best! I switched to Millers within the last year because of their excellent turnaround times along with great quality. I wondered about the making-of more than once and was tickled to see this video. I plan to continue to be a customer for a long time to come. Thanks for posting these interesting behind-the-scenes photos of your facility. I enjoyed seeing what goes into making a professional album. I like the lava lamp on the desk of the Albums Department. Looks like a cool crew working at Millers! I love the quality of your wedding albums. 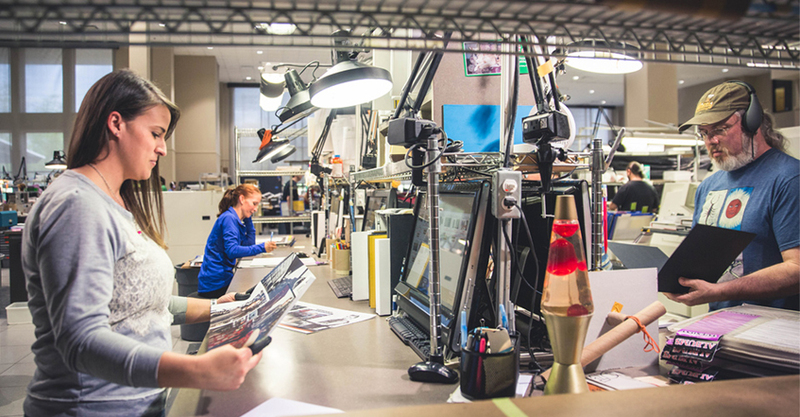 This article gives a fabulous insight how the quality Signature Album is made. Thanks for sharing and I’ve always enjoyed making albums through Miller’s! Thank you for this great behind the scenes look! While I have not yet ordered a signature album after seeing this process and all the care that goes into what really is a timeless classic I am eager to get one started! Have been in love with Miller’s since day 1. This is just one more way I can assure my clients they are getting the best. Thanks so much for the kind words Lynn, we can’t wait to see your order come through the lab! These signature albums are our favorite Miller’s product. We have always wondered what the process is for producing them. So it is so nice to see this behind the scenes. We love getting the previews for each album. The anticipation is a little like Christmas. The artists who do the designs are incredible. The quality is beyond compare. Thanks so much for the kind words, Margaret! I love the behind the scenes! And can I add that I love the person that has a lava lamp at their work station? I love Millers….anythhing looks wrong or spelled wrong they will call and ask to do over..I love how the y edit, your work..quality. At age 47 I decided to take the plunge into serious study, practice and creative labor……after two years i’m closer than ever to striking out on my own. I’m moving to Washington state and starting new…as part of my research in finding an album source, I came upon your fine company. You can be sure that when I take my first order for an album, it will be for one that you help me create….I’m looking forward to offering your products and collaborating to create art together. Thanks so much for the kind words, Hank. Best of luck on your new adventure!